Be the first to share your favorite memory, photo or story of Fern. This memorial page is dedicated for family, friends and future generations to celebrate the life of their loved one. 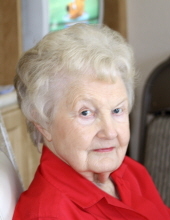 Fern M. Olson, age 93, passed away Thursday, January 31, 2019, at Fremont Health. Fern was born November 2, 1925, to Lillie (Seberg) and J. Howard Peterson in Oakland, Nebraska. She attended Oakland High School and graduated in 1943. After graduation Fern worked on the family farm until she married Dale. Fern married Dale in Oakland on June 29, 1949 and, soon after, moved to Fremont where Fern was a wife and mother. Fern loved her roles as wife, mother, grandmother and friend to many...and she excelled in them all. She cared for Dale and Nancy well, and was quite the mother-in-law to Mic and “Nana” to Alec, Sam and Lillie. She also was a mother to their two AFS exchange daughters....Fiona from Rugby, England and Celia from Sydney, Australia. She loved all of her friends, whether from church, bridge, the neighborhood or the new ones she met at the grocery store!!! She was a member of First United Methodist Church, Sarah Circle, P.E.O., Eastern Star, and multiple bridge groups. Fern was awarded the Fremont Area Community Foundation Philanthropic Award in 2011. Visitation: 4:00 - 8:00 PM Thursday, February 7, 2019, at Dugan Funeral Chapel. Funeral Services: 10:30 AM Friday, February 8, 2019, at First United Methodist Church. Pastors Bill Gepford and Scott Jensen will officiate. To send flowers or a remembrance gift to the family of Fern M. Olson, please visit our Tribute Store. "Email Address" would like to share the life celebration of Fern M. Olson. Click on the "link" to go to share a favorite memory or leave a condolence message for the family.